The company that became synonymous with roll cages. 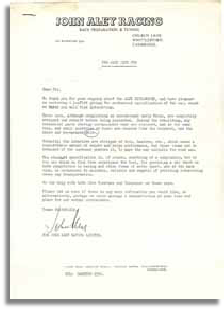 There are not many people who's name is absolutely synonymous with a part of a Mini, but John Aley is an honourable exception. 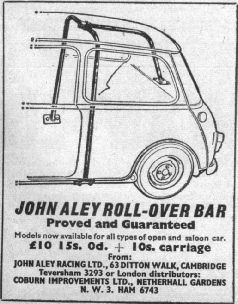 Before going on to found Aleybars, the first full time manufacturer of rollover bars for racing cars & Mini's in particular, John was involved in the supply and preparation of racing Minis. To the left you will see a flier promoting his ALLEY MINI-RACER a budget level, ready to run racing Mini. A bargain at around £400 complete!